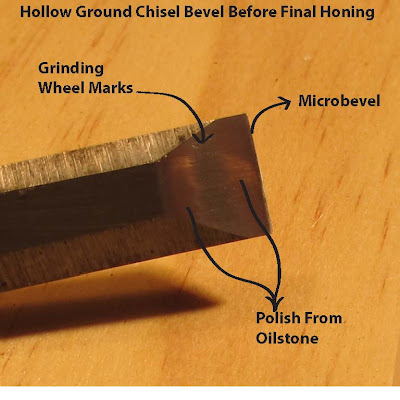 A very simple guide is to use shallower angles (20°-25°) for paring (paring chisels and plane blades) and steeper angles (30°-35°) for something you intend to hit with a mallet (mortise chisel). The angles you intend to use will have an impact on the life of your newly sharpened edge. The impact from a mallet blow may curl up your nice sharp edge on a chisel with a bevel angle under 30° especially in harder woods. Variances in plane blade angles can affect their ability to work efficiently in the wood you are cutting. Generally, a shallower angle is good for softer woods and endgrains while a steeper angle is better for hard woods to avoid tear-out and to maintain your blade edge. I start with a 20° bevel and go up, sometimes as high as 40°, with a microbevel depending on the needs of the wood I am planing. Microbevels are great because they are easy to change and very quick to hone. They do, however, require some practice to sharpen freehand. 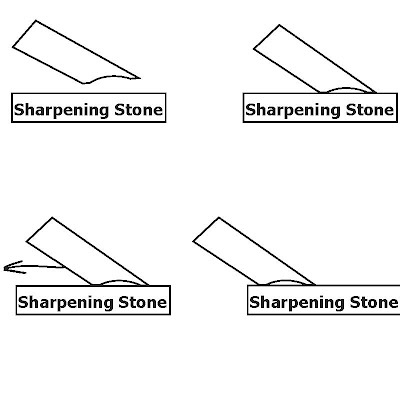 Below is a sketch of some common terms used in sharpening chisels and plane irons. You can get as accurate with these angles as your ability, technique and tools will let you get. I know people who argue that 32° makes a huge difference over 35°. I, personally, am not in tune with my senses enough to be able to tell the difference for most projects. I prefer a flat bevel sharpened to 30° with a microbevel of an additional 5 degrees on chisels I plan to hit with a mallet. This, I feel, gives me a good, lasting edge that is easy to sharpen and most importantly is repeatable. I reiterate for importance sake, repeatable. I feel that all the wonderfully weird and super accurate (or not so accurate in some cases) sharpening techniques are great if you are only going to sharpen your tools one time. I want the bevels on my tools to be easily honed by hand, repeatedly and accurately. I am also not always in my workshop when I am using my tools so I want to be able to get them razor sharp quickly and without a lot of fuss. That is why I see great value in being very accurate and deliberate when I first sharpen and set up a blade. The initial process of prepping a blade can be very time consuming but will pay off dividends in the long run (at least in my humble opinion). I also believe that it pays to know your tools. A good knowledge of your tools will come from using them, a lot. I know that I have, for example, a bench chisel that came in a set that is different from the rest. It may have been made on a Monday while the rest were made on Friday, but it will hold an edge better than the rest of the set. It is also much harder to hone, which means that I need it at a simple angle with a large bevel (flat ground) so I can hone it by hand when I'm not in my workshop. I have a couple of chisels that I have hollow ground for ease of honing but they are pairing chisels (or chisels I use for paring more than chopping). They sharpen quickly and get razor sharp. I have them sharpened at a 25° angle and they work great. 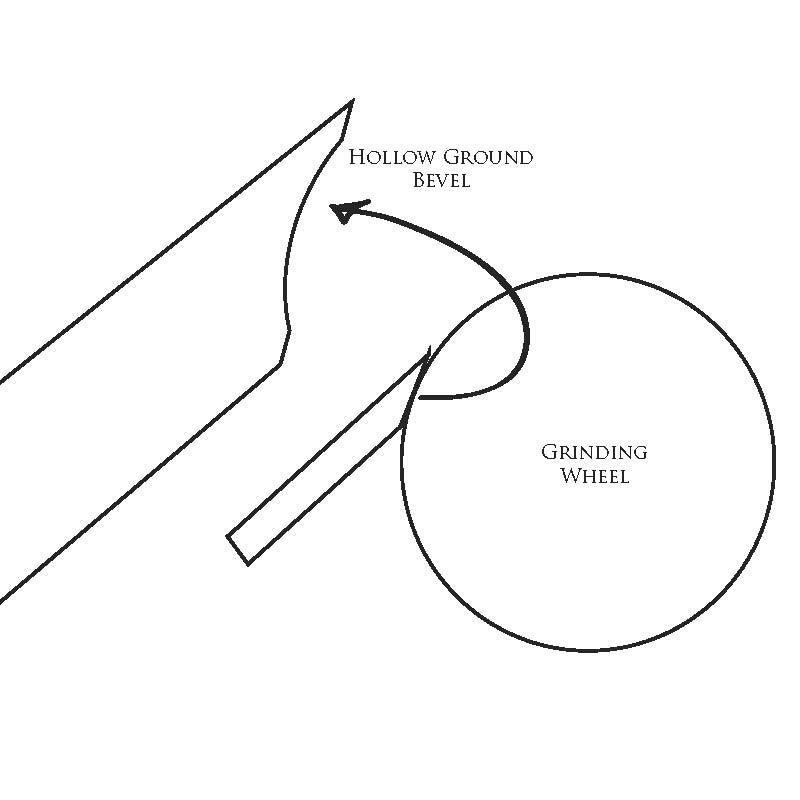 The hollow grind also makes it easier to hand sharpen by hand. 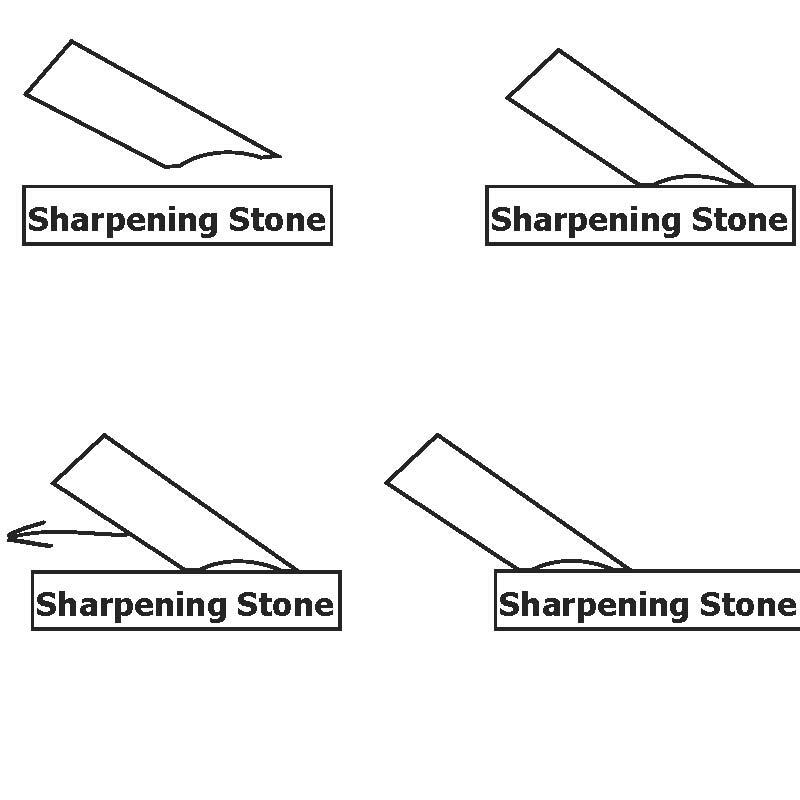 There is much less material to remove and when setting the bevel onto the stone I can feel when both front and back have settled onto the stones surface so I can draw the bevel back to hone (see poorly drawn diagram). I do have some, dare I say, nicer plane irons and chisels that I prefer to keep at exacting angles. To sharpen and hone these, and some new/antique chisels and plane irons for their initial setup, I use a sharpening guide. 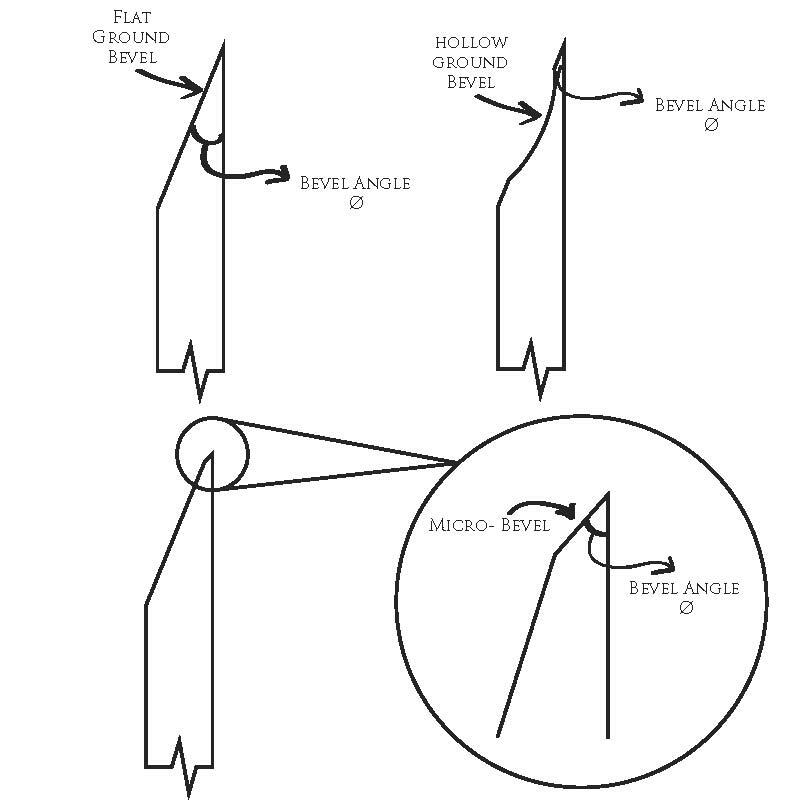 This guide is great for the initial setup of tools as it puts a very accurate angle onto the bevel. I personally use a Veritas MKII Honing Guide. There are more inexpensive, just as effective, honing guides on the market (I got this one as a gift), but I can speak to the effectiveness of this jig. This guide works great, it is consistent, comes with decent instructions and very easy to use especially on flat ground blades. Some folks see these types of guides as the end of an era. 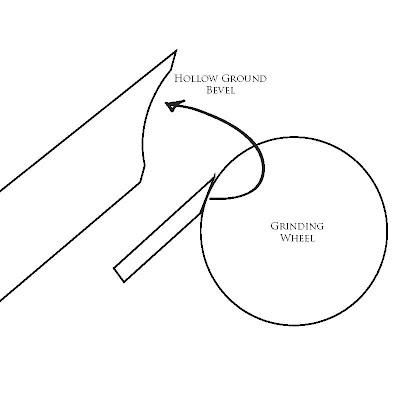 I see nothing wrong with using a jig like this to sharpen and hone your blades. It is fast enough that in a matter of minutes I can hone almost all of my daily use chisels and plane irons. It is accurate enough to put repeatable secondary bevels on your tools and works for a range of woodworking tools. I do, however, see the merit in learning to sharpen your tools freehand. Freehand sharpening is the traditional method and is something of a right of passage for many carpenters. It is also probably the fastest method to sharpen anything you have, but a jig can help get you started making shavings right away if you are not well practiced in sharpening your irons. Plenty more to come, and some videos about sharpening techniques and methods are currently being edited! Get sharpening and start making some shavings!